Several years ago, I closed on my very first home. Like most gung-ho DIYers with a few years of HGTV binge-watching under my belt, I expected that there would be budgeting. I expected that there would be weekends spent sweating and laboring in one form of dust or another. I even expected that I wouldn’t know how to do half of the changes I wanted to make. But despite my pride and preparedness for my own shortcomings, I also made a lot of assumptions – and I soon realized that many of them were unfounded. Below, I share my top five things I really wish I knew before starting do-it-yourself renovations. Part of the fun of shopping for a house is imagining how you’d make it your own. So, as you might expect, I was thrilled to stop at the home improvement store the second the keys to the front door were in my hands. I wanted to paint the walls before I moved in all the furniture. So practical, right? I also hated all of the heavy and dated curtains left behind. But what I didn’t take into account was how long it would take me to actually adjust to life in my new house. I didn’t yet know how dark and cavern-like the living room would look with the trendy new paint color I’d selected. I didn’t yet realize how blinding the sunlight would be when filtered through my new bedroom sheers. I wound up painting the living room all over again to something lighter (which means twice the work and cost of getting it right the first time), and added two-inch blinds to the bedroom windows to help block out morning light. Lesson learned: don’t create your to-do list before getting to know your new self and your new habits in your new home. Everyone I know insists that they know someone who has the best apple pie recipe, but none of them ever seems to name the same person. 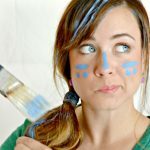 So, just like cooking, what makes one method the “best” way to tackle a DIY project for one person doesn’t necessarily work for another. One video, no matter how reasonable and expert it seems, is never enough! Some methods are just plain wrong, so it’s better to review several tutorials before embarking on your latest repair or home remodel. You may learn a technique that one tutorial didn’t have or be able to better problem-solve the unique circumstances in your own house (such as figuring out how best to tile around my kitchen window… two out of the three backsplash tutorials I looked at completely skipped this part). The collective knowledge gained will also reinforce good habits and help you break bad ones! 3. Visualize things before making big purchases … and always bring a tape measure! Before snatching up the shockingly undervalued antique that you know would look so amazing as your new bathroom vanity, it’s best to know if it’s even going to actually fit the sink bowl and faucet. Otherwise, you’ll just wind up owning an overpriced former antique with a big hole in it – and still without a bathroom vanity. I’ve gotten lucky a few times and Tim Gunn-ed my way through a DIY renovation or two, but that kind of stress and assumption leads to hasty choices, increased costs and needless worry. I now have a mini tape measure keychain that I always take with me when shopping. I also tape off parts of my floor to the measurements of whatever I’m about to buy because it helps me better picture how it will fit and saves me lots of stressful phone calls later. Learning that you should have done something differently mid-project is never a fun experience, and it can eat away your budget in fines at the city, county, and state levels if not done correctly. Getting permits can be a pain, but not having one when you should have had it could make the work you do subject to all sorts of penalties or worse (like needing to be completely redone). When in doubt, a simple phone call for expertise can go a long way (not to mention, it never hurts to be on good terms or first-name basis with the folks in charge). This may seem like the complete opposite advice as my first tip above, but as much as I wish I’d waited on some decisions, I also wish I’d known how much harder it would be to keep the same energy and momentum going after the first year of renovations. Between washing my dishes in the bathtub while I rehabbed the kitchen to letting laundry pile up in the dining room while I worked on the laundry room floor, living in renovation chaos can feel… well, chaotic. Instead of my home being my sanctuary to greet me at the end of a long day of work, it was instead sort of like a second job – without a chance to take a break, the stress can really feel like there’s no finish line. Eventually, I found a good balance between weekends of working on projects and weekends where I could just enjoy the spaces I’ve transformed, but it can still sometimes be harder to see the “home” I’ve created for the enormous project I never feel is finished. To combat this, pick a single room that can serve as a sanctuary – the master bedroom, the luxury bath, or even a home office – and completely finish it within the first twelve months of living there, right down to the scented candles. Once you create a stress-free place to escape to when needed, handling the other hurdles will seem far less chaotic. In the end, do-it-yourself renovations can be incredibly rewarding, but it can also completely zap a person’s creative energy. Whether well intentioned or not, there were a number of things that would have been helpful to know diving in headfirst into my first fixer-upper. But, my loss can be your gain – and now you can tackle your next DIY a little bit easier! Images within the article courtesy of The Ugly Duckling House blog. All rights reserved. A self-professed "power tool addict", spurring a passion for all things DIY. Sarah believes that with patience, determination, and a healthy dose of humor, home improvement is something anyone can learn.